Haier’s 11.11 journey began with a single decision, to provide our consumers with the best deals online. Especially the consumer who shops products from the most famous online portal called Daraz. The campaign to bring the best deals for Haier’s loyal consumers began when Haier announced its much-awaited collaboration. We began with a simple pre-hype phase, people were asked to mark their calendars for the big sale and needless to say they did as depicted by the mega sales of Haier products on 11.11. We entered the hype phase and asked people to visit Daraz and have a look at the amazing deals promised on 11.11. People responded with comments and direct messages with their amazing answers and responses to our engagement activities and some lucky winners got exciting prizes as well. The build-up to the sale was not only exciting – it was an adrenaline rush! The day came and the excitement of buying their favorite products came with it. The news spread like wildfire and became the talk of the town as soon as the big collaboration was announced. Everyone was anxiously waiting for the big day. They started making a shopping list beforehand. Haier cares about the needs and wishes of its customers. That is why Haier provided its customers with amazing discount offers – offers that were difficult to go unrecognized. It was a dream come true for a person planning to switch to a luxurious lifestyle. Haier’s product range comprises of all the leading innovative technologies required for a smart lifestyle. Whether it’s a smart television which supports the leading innovative mobile mirroring application called Miracast; or whether it’s a smart washing machine, which you can operate with just one touch. This sale was a chance for the consumers to avail an amazing offer and buy electric home appliances which have all the leading innovative features. With an enduring number of 1.41 million people reached and 2.35 million impressions, more than 40 thousand engagements, YouTube views of 241 thousand and acquirement of more than 40 thousand fans on digital sphere, we know Haier for sure, is the market leader in the truest sense. At last, the day came. The day that everyone was waiting for. There were mixed feelings in the air. Everyone was excited about the sale but a little anxious as well. They were excited because they were finally about to buy the product of their dreams. But, they were worried as well. What if the product they wished to buy ran out? What if someone else bought the product before them? These were all the questions that were running in the minds of the customers who were anxiously waiting for the biggest sale in the history of Pakistan. We are proud to announce that the sale on Haier’s electronic home appliances was more than what was expected. 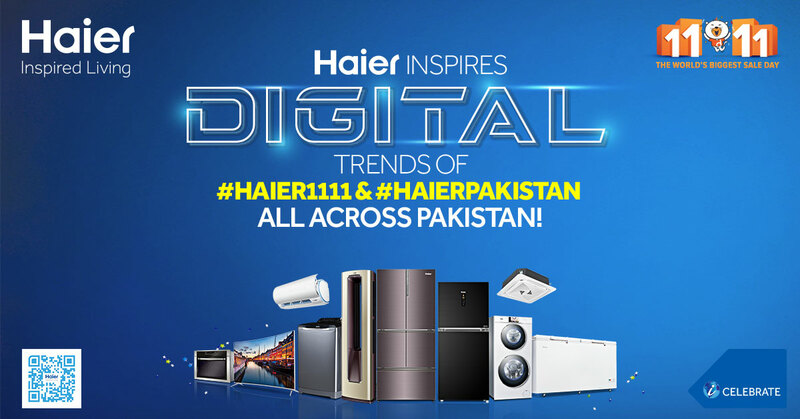 And we are grateful to everybody who made this collaboration between Haier and 11.11, a monumental success.